A storied hedge fund manager and a large pension program chieftain have some tales from the front for you. Michael Trotsky has been running the Massachusetts Pension Reserves Investment Management Board for almost a decade, but admitted Tuesday that there was a steep learning curve when he made the transition to the public from the private sector. 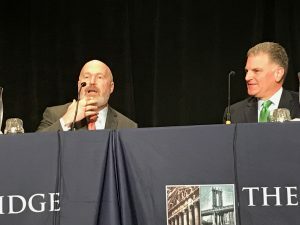 In an appearance at the Pension Bridge conference in San Francisco, alongside AQR founder Cliff Asness, the $74 billion fund’s executive director (also its chief investment officer), admitted he was originally lacking in a few areas. He came from Boston-based hedge fund PAR Capital Management to the pension organization, which houses the assets of both the Massachusetts Teachers’ and State Employees’ Retirement Systems as well as 100 participating municipal and county retirement systems. And the transition to the political world was jarring. Following chuckles, the hedge man then got serious. Asness warned that not all experiences will be good ones when it comes to committees, and shared a story about a rough one. At an endowment he was with about a year before the financial crisis, the committee wanted to add more stocks but felt the market was overvalued. The institution then said if a crash came it could “back up the truck,” meaning take a bullish position, according to Asness. “Can anyone here take a guess what gear the truck was thrown into?” he asked the Pension Bridge crowd. Trotsky jumped in to say a key advantage of his organization over his peers is a reasonable board. The CIO said he has experienced two “great surprises” in his time at the fund. The first is being at an organization that is able to attract great talent regularly. The second, and “greatest” surprise, is that Trotsky has never been forced to hire or fire a person or a firm.